Truffle fries are a staple item in many NYC restaurants which has triggered my ongoing craving for them. Because I don’t want to dine out or eat fried food all the time, I took matters into my own hands and created an oven-baked truffle fries recipe that is a wonderful compromise. Also, don’t skip out on making the aioli. It’s freaking delicious and definitely superior to ketchup. A few tips when making oven-baked fries to ensure success. Firstly, it’s important to soak your potatoes in cold water, the longer the better. Soaking removes excess starch, which will help them get crispier. Secondly, it’s essential for the fries to be very dry in order for them to get crispy. I went as far as drying each individual fry. Lastly, don’t overcrowd the pan. If the fries are spread out in a single layer they will cook more evenly. That is why I recommend two baking pans in this recipe. Cutting potatoes into sticks is quick and simple. Best way to do it is slice a little bit of the root end of the potato so it can stand flat on the cutting board. Slice potato in half lengthwise and then slice the halves in half lengthwise. Working with one quarter at a time slice into 1/4″ thick lengths, and slice each length so 1/4″ thick sticks. Want more truffle in your life? Try my nut-based Clothbound Truffle ‘Cheese’. In a large bowl soak cut potatoes in cold water for at least 1 hour or cover and refrigerate overnight. Remove potatoes from water and pat with a clean towel until dry (the more dry the crispier the fries will be). Preheat the oven to 425°F. Line two baking trays with parchment paper. In a large bowl toss the cut potatoes with olive oil and a few pinches of sea salt. Distribute potatoes in one single layer on the baking trays. Bake for 40 minutes or until golden and crisp, flipping fries halfway. Tip: If the bottom pan of fries are not golden, place the tray on the top and turn oven to broil for a couple minutes at the end. Toss the fries with truffle oil, parsley, salt to taste, and optional parmesan. Serve hot with Garlic Truffle Aioli. In a small bowl stir together all the aioli ingredients. Serve with fries. 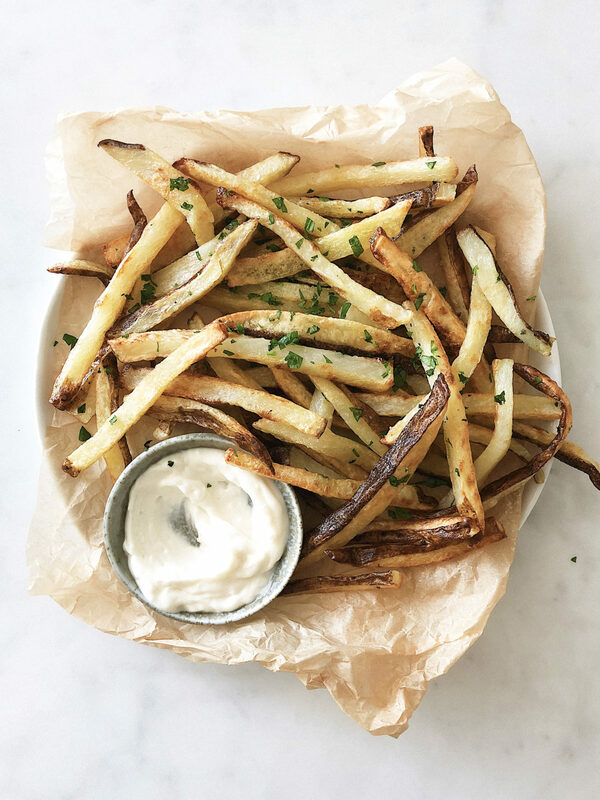 This entry was posted in Starters/Sides and tagged farmers market, french fries, gluten-free, healthy, healthyish, potassium, potatoes, spring, summer, truffle fries, Vegan, Vegetarian, wellness, whole foods. Bookmark the permalink.